The heritage of Siegen as a home for education and research dates back to the 16th century. In 1536, William the Rich assigned to Saxon educator and theologian Erasmus Sarcerius the task of reconstituting a Siegen-based Latin school to establish what we call today a high school. During the period 1595 to 1599 and 1606 to 1609, the "Universa Schola Nassovica Sigenensis" was established, the "High School" for the Land of Nassau, within the city’s walls. 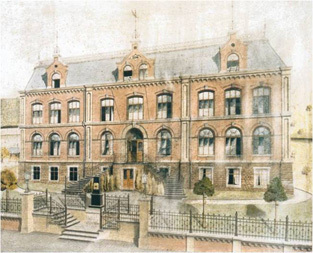 "Wiesenbauschule", a landscaping school established in 1853, of renown well beyond its local area, laid the foundation for University of Siegen. Following World War Two, its focus was shifted towards civil engineering and, in 1962, it was renamed "Staatliche Ingenieurschule für Bauwesen" (State School of Civil Engineering). The mechanical engineering department, meanwhile, has its roots in the "Fachschule für Eisen- und Stahlindustrie" (Iron and Steel Technical College), which was established in 1900. With the foundation of "Pädagogische Hochschule Siegerland" (Educational University Siegerland) in 1964, Siegen’s academic heritage saw a revival. In 1972, the merger of the technical college and educational university paved the way for the establishment of University of Siegen (in the form of a comprehensive university). The new university started by offering a total of nine university programmes. The mission of the five comprehensive universities which were simultaneously founded at that time in North Rhine-Westphalia (Siegen, Wuppertal, Essen-Duisburg and Paderborn) was to bring together theoretical and practical training, to implement enhanced permeability and equality of opportunity in the educational system while driving a more regional approach to study programmes and research.